1940'S BLAKE MFG. HOLLY MI JIGGER WAS BROUGHT BACK FROM THE DYING. WAS IN REAL BAD SHAPE WHEN i GOT IT. WORKS GREAT LOOKS FANTASTIC. stand NOT included. Vintage Chuck a Luck Dice Game Birdcage 3 Dice from a Casino. Extremely well made and heavy dice cage measuring 16 1/2" tall and 13 1/2" wide. All original nickel plated cast iron, the top and bottom of the cage are vellum skin with some wear as shown. Works smoothly, almost looks like new old stock. For sale is a beautiful antique trade stimulator. Shows a little restoration and a little wear. A fun and very unique looking antique. Machine will be double boxed. A rare machine that would look great in any collection. Good condition. Top cover missing. A penny operated double loop stimulator. Intended as a trade stimulator, not as a gaming device. The objective would be to get the highest score by getting each steel ball in the selected pockets. Item Up For Sale:1 Cent Caille "Ball Gum" 3-Reel Your Fortune Gumball Trade Stimulator c1926. Made by Caille Brothers. It would dispense a gumball and give you your fortune. This machine is in original condition. THIS IS AN OVERALL GOOD PIECE AND DISPLAYS VERY WELL ANYWHERE W/NICE COLOR and GRAPHIC'S! Antique Coin-Op Mills Novelty Machine Trade Stimulator Target Practice Slot 1 Cent 18" x 12" x 8". In good working condition, but does show signs of use, scuffs and surface marks. The simulator works. As you can see there are a few pieces that need replacing, including the paper on the front. It is also missing a plunger that went on the lower left. I am unsure who painted this or when this was painted. Rodeway Inn opened in 1980 and is now closed. The condition is fantastic. You must view all the photos to see how nice this machine is. I believe it's from the late 1920's or early 1930's. This machine has original paint and finish on the wooden cabinet. The viewer has many different cards most are in color. Works well. 1 penny buys you 7-10 different cards. Includes key. No Reserve! Good Luck! We have left the pictures large so you can zoom in to see all the details. Has a few punch marks. 10 x 9 x 1". Condition as Pictured. Still working with a key. In good original shape. Really neat very old item. So take a good look at the photos. These will show you its overall good original shape. As shown and found. I have several really nice antiques and toys up right now. This is a nice working Mills TARGET practice 1 cent trade stimulator. 1933 Trade Stimulator BALLY "CUB" 1 Cent "Watch Video"
Video will open in a new window [isdntekvideo]. For sale is a beautiful antique trade stimulator. (Page 125). A fun and very unique looking antique. Colors still vibrant on play field. Works great. Very clean. Machine will be double boxed. Original paper instructions on inside of front panel (See Photos). Rare poker 10 cent electric trade stimulator. Stimulator is probably from the 1950s. Patent 1906 Brunhoff Electric Lighter No. 325 in as found condition. There is a wood chip on the wood base. I have no idea how it would have worked. There is a little side slide door in the back to get rid of the cut offs. See photo for actual condition. You are viewing an original old trade stimulator. as found in estate, has wear, no back door, no lock, does work, 5 cent lever pull and the reels run correctly, overall good condition. EVEN THOUGH THE ITEM IS UNUSED AND UNPUNCHED IN THE 2ND PHOTO ON THE BOTTM ROW IT SHOWS WHERE THE THIN PAPER BACKING DETERIRATED FROM AGE AND THE PUNCHES FELL OUT - DOES NOT AFFECT THE DESIRABILITY OF THIS COLORFUL OLD PUNCHBOARD. 1932 Trade Stimulator Keeney Steeplechase Horse Racing #2 "Watch Video"
Jim Schafer & Jeff Walker. Video will open in a new window. Paste link into a browser window:[isdntekvideo]. Trade Stimulator Puritan Mayflower. No keys for lock. Not running. This being a napkin holder makes it a rare piece. I was told by the gentleman that I received it from that it is 1947 era. 1936 Trade Stimulator M-R Advertising System Electric Carny Wheel "WATCH VIDEO"
Our 3,500 sq. ft. Studio and Showroom is located in beautiful Orange California between Angel’s Stadium and Disneyland. Video will open in a new window[isdntekvideo]. Displays beautifully, unpunched and unused. No repairs. Over 100,000,000 served. 1932 Trade Stimulator Keeney Steeplechase Horse Racing "Watch Video"
Jim Schafer & Jeff Walker. Video will open in a new window[isdntekvideo]. 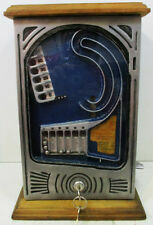 A penny operated Poker Skill Trade stimulator, circa 1940's. Intended as a trade stimulator, not as a gaming device. The objective would be to get the highest playing poker hand by rotating the round devider. This is a nice working 5 cent Lucky 7 dice trade stimulator. The object is to guess whether the sum of the dice will roll under 7 or over 7 or a 7. Score system is Guess 7= 4 points, guess over 7 =1 point,guess under 7 =1 point and guess incorrectly minus 1 point. Challenger Shooting Gallery . Condition is Used. Shipped with UPS Ground. Deposit a nickel or quarter into the coin slot, pull the handle and watch the reels spin. ORIGINAL trade stimulator in good working condition. Has a jackpot lock and back door lock. Good working condition. 1947 Trade Stimulator DAVAL "Best Hand" Card Game "WATCH VIDEO"
Video will open in a new window. Paste link into a browser window:[isdntekvideo]. Our 3,500 sq. ft. Studio and Showroom is located in beautiful Orange California between Angel’s Stadium and Disneyland. 1929 Trade Stimulator Fields Paper Products "BABY JACKPOT" "Watch Our Video"